Originally from Iowa, The Rev. 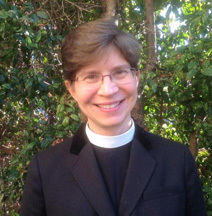 Stephanie M. Green has served the Episcopal Diocese of California and the Episcopal Diocese of El Camino Real for twenty years, predominantly in children’s, youth, family and young adult ministries. As a bi-vocational priest with one foot in academe, she has a passion for teaching and learning with people of all ages. She finds that the longer she is a priest, the more she is a teacher, and the longer she is a teacher, the more she is a priest. Stephanie is especially devoted in her ministry to forming creative connections between worship, learning, fellowship and service for the incorporation of young people into the full life of the church. Before arriving in California, Reverend Stephanie spent three years in Jerusalem serving the Anglican cathedral and advancing an interfaith project for religiously committed Jews, Christians, and Muslims to share study, fellowship through meals, and attendance at once another’s worship. Her devotion to cultivating understanding and meeting the holy across religious and other boundaries continues to inspire her work in the Church and beyond. Stephanie is involved in racial equity and arts initiatives in Berkeley where her eleven-year-old son, Liam, is a student in middle school.